The Epic Beyond proudly presents the second novel by A. Jordan Booth: Death and Professor Longfellow. This novel tells the story of perseverance against in the face of Death… literally. Professor Robert Longfellow plodded through life with one unassailable mission, to ‘to enlighten and ennoble young minds’. That is until his heart was shattered by the disinterested fish eyed stares of his students, and the slightly less painful bullet of a mugger. “Death” appears to him as the most terrifying thing Longfellow can imagine, a vivacious beguiling spitfire of a woman. Despite his heartbreak, Longfellow doesn’t want to die. Against her better judgement, Death offers him a one time escape. She’ll return him to life, but he’s going to have to earn it. She places before him Herculean trials to overcome. The old man is going to have to do something he never imagined… have an adventure. 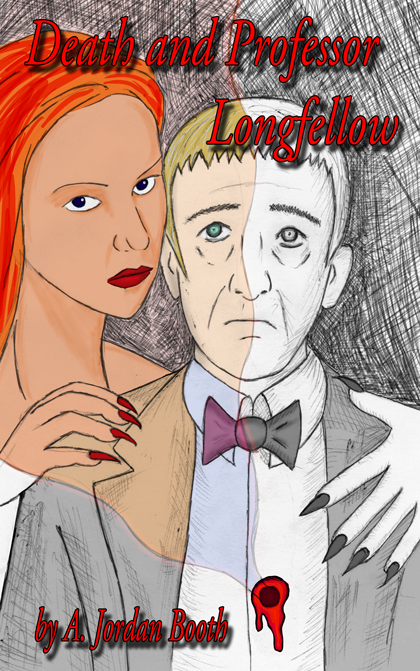 For a man who has become completely disillusioned with his life’s work, and never had much else to make him feel alive, nothing will be harder for Longfellow. Can the Professor win his way back to the world of the living? With Death bullying, taunting, and tricking him can he even trust her? If he even wins what is there worth living for?